SHOULDER HEIGHT: M - 51" F - 47"
The Waterbuck is a large, robust and stately looking animal. They have coarse, shaggy coats and there is a shaggy tuff on the underside of the neck. Their coats are a grayish brown and their lower legs are black in color. Waterbucks have large rounded ears and white patches above the eyes and around the nose and mouth with a cream colored bib on the throat. 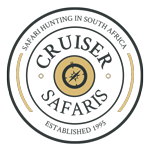 The most conspicuous feature of the Waterbuck is the white ring that surrounds the base of the tail on the rump. Only males have horns. They have numerous glands over their body which produce a musky smelling secretion that is believed to have a waterproofing and insect repelling function. Only male Waterbucks have the impressive backward curving horns. The widely spaced horns project backwards, then curve upwards and outwards, finally forward at the tips. The horns are heavily ridged almost all the way to the sharp tips. With these sharp tips, when males confront each other in combat, death to one of the combatants is common. The horn lengths may reach 36 - 37 inches although horns longer than 30 inches are exceptional. Despite its name, the Waterbuck is not truly aquatic nor as much at home in water and swamps as some other antelope of southern Africa. Waterbucks are very intolerant of dehydration, having to drink daily or every other day, therefore they are usually found within 1 - 2 miles of water. They are usually the first animal to suffer during periods of draught. 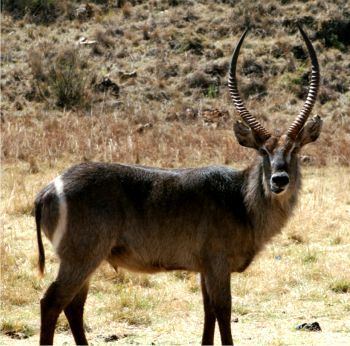 Waterbuck's favorite habitats are good quality long grass areas along with dense woody areas. They prefer flat terrain but are also found in rocky areas. They will avoid over grazed areas. Waterbucks are predominately grazers, with 80% of their diet consisting of grasses and 20% from the leaves of trees and shrubs. Waterbuck's graze mainly on long grasses, which is essential as they are physically incapable of getting their mouths close enough to the ground to feed on short grass. Waterbucks normally feed on coarse grass that grows on or near flood plains and large stretches of water that are seldom eaten by other grazing animals. They feed in the mornings and at night and rest and ruminate the remainder of the time. Despite its name, the Waterbuck is not truly aquatic as are the Sitatunga or Lechwe. They are good swimmers and wade into shallow water when drinking and are known to seek sanctuary in deeper water when pursued by predators. They are usually found in breeding herds of 6 - 12, sometimes larger, led by a territorial bull. Some territorial bulls will tolerate the presence of a subordinate male for a short period of time as long as they behave submissively. Young males are forced out of breeding herds when they are 9 - 12 months of age where they join free roaming bachelor herds that have no territory. Territorial males defend their herds throughout the year. They show their status by standing with the neck erect and head up, showing the white band on the throat. Lowering the horns toward an intruder and shaking the head is a strong threat. Serious fights are fierce and more often than any other antelope are fatal. Females leave the herd and move to thick cover to give birth. Usually a single calf is born, but there are rare instances of twins. The new born calves remain hidden for 3 weeks, with the mother returning to the hiding spot 3 - 4 times a day to suckle it. After joining the herd the young follow their mothers closely. The mothers signal the calves to follow when she raises her tail. The calves are weaned in 6 - 7 months. Females mate again soon after giving birth.